Graduating senior Abigail Koehler has been named as the College of Arts and Architecture's student marshal for the commencement ceremony on May 6. She will be accompanied by trombone professor Mark L. Lusk. 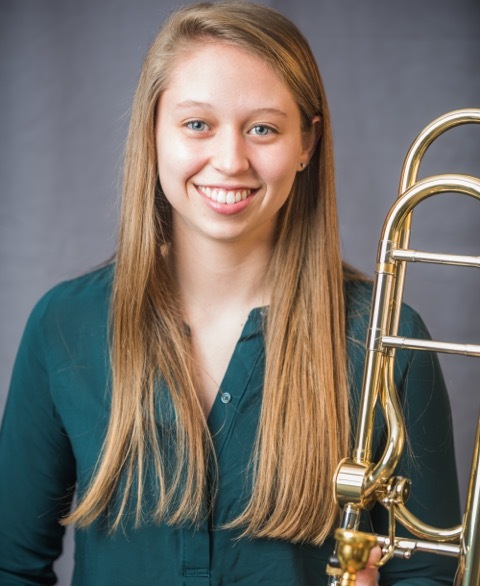 Abigail is a music education major from Wexford, PA. A Schreyer Honors College student, she studied trombone in the studio of Mark L. Lusk prior to her current student teaching placement in the Hollidaysburg Area School District. She served as secretary of Penn State’s NAfME Collegiate chapter and also was the student representative on the College of Arts and Architecture’s General Education Committee. She received the President’s Freshman Award at the end of her first year on the University Park campus, was on the Dean’s List for seven semesters, and was inducted into Pi Kappa Lambda National Music Honors Society. Her ensemble record includes participation as an instrumentalist and singer. During her Penn State career, she was a member of Symphonic Band, Marching Blue Band, various jazz bands, Campus Orchestra, Percussion Ensemble, Trombone Choir, Women’s Chorale, and Oriana Singers. Abigail's thesis project, “High School Music Theory: Perceptions of the AP Music Theory Exam’s Influence on Teaching and Learning,” was one of four research projects selected for presentation at the Pennsylvania Music Educators Association’s In-service Conference on April 20, 2017. Fewer than 25% of the submitted projects were chosen, among research investigations submitted by faculty and graduate students throughout the commonwealth of Pennsylvania. Her research was also accepted for a research poster presentation at the Eastern Division Conference of the National Association for Music Education in Atlantic City, NJ. The daughter of Scott and Sherry Koehler, Abigail plans to pursue an advanced degree in trombone performance after graduation. Music theory professor Eric McKee served as her thesis advisor. Her academic advisor is music education professor Linda Thornton.